No matter who we are, where we come from, how much or little money we have, what we suffered through in the past, there is a truth that applies to each of us. It is this; whether we like it or not we have the power of choice. Now, why would we possibly not like knowing this truth? It's because it means we have to accept that we have a measure of control and with that control comes the reality that we may have to change and we can no longer blame our current circumstances on our past. Too many people look at where they are in life and lay the blame on an individual, group of people, or experience from their past. However, there are countless examples of individuals who have overcome horrible experiences that would cause many to give up and just accept fate yet they did not. They ultimately realized they had the power to choose what they did with what they went through. They took ownership of who they would be moving forward, how they would live differently and in doing so they changed the course of their life. No longer was their life defined and ruled by their past. We each get to choose whether we live out of the past and are that version of ourselves or whether we're going to live out of the of the potential of who we can be. We can't control what happens to us, but we can control how we let it impact and influence our life. If we live out of the past all it serves to do is keep us stuck. We are stuck emotionally and psychologically. When we accept that then we never allow ourselves to move beyond those limitation. However, to accept ownership of the control available to us puts us on a path of growth and change. By definition that means we'll be more than who we are now, or who we think we are. For some, this acceptance and taking ownership and control comes as one big change. For others, this is a process. At the end of the day, what matters is that the choice is made and the journey into a more full life begins. In my case, really changing my mindset, breaking down my emotional and mental barriers, and taking a more intentional approach about my life choices was a process. I had a progressive awakening and shedding of the chains that held me down. Once out of high school it was time for the jump into the bigger pond of college and "real life". At that point, I was so unsure of who I really was or who I wanted to be that I just played the part of the well intentioned, college prepped, future focused young adult I figured everyone expected me to be. You need to understand that for me, there has always been this spiritual component to my life. I was raised in church. I was raised on Sunday morning sermons, Wednesday night attendance, and Sunday school lessons. I'm not saying those things are bad because they aren't. Honestly, without the grounding that I had through my family being God-centered I'd have made many more harmful choices as a young man exposed to a new world than I did. Understanding that there was an expectation of how I would act and the choices I would make as a professed follower of Christ always played a part in my psyche. That first two years out of high school were a tug of war between the emotional struggle of the choices I made trying to determine my identity as a man along with the spiritual guilt they brought and trying avoid making those choices in the first place. Because of the lack of self-confidence I'd developed during my school years I was struggling to live rightly with confidence. I still felt defined and valued by how other people saw and treated me. During those early college and university years I met a lot of good people. Though I didn't fully have the awareness of what it meant to be a brother or sister in Christ, these people were positive, Christian influences that helped me to never go completely "off the reservation" so to speak. As I transitioned from the junior college to the university after my first year I met some friends who I'm still in contact with to this day. Their acceptance and inclusion of me was the first really big step into me beginning to understand that people could genuinely like me for the person I was at that moment. To them, I wasn't defined by any past experiences. They got to determine to be my friends by the person they met then. The first steps to freeing my soul from the chains of the past were taken. Next, I had to continue to grow by putting myself in situations that required me to step out of my comfort zone, to test my self-imposed social and mental limitations and boundaries. Though I didn't realize it at the time, I was spiritually seeking a breaking down of walls of how I saw myself as well. The Lord works though and in ways we will never understand and can never hope to know beforehand. I now had the awareness that my past didn't necessarily have to define how I though of myself as I saw that it didn't define how others saw me. To begin to take ownership and control would require a much grander journey, but the seeds were there. And in that, I had the choice to either pursue the unknown yet possible or retreat and stay where I was "safe", knowing what was expected of me and how to play it well. I chose to keep moving forward, to not be satisfied with who or where I was. I can't say that it was an overwhelmingly confident pursuit, but I was now at a place where I would look at an opportunity and say "why not?" and "what's possible?" instead of dismissing it with an "I can't". My comfort zone was about to get a great big expansion. I asked for it and I got it. Struggles still pursed me and persisted, but things began to change and for the better. 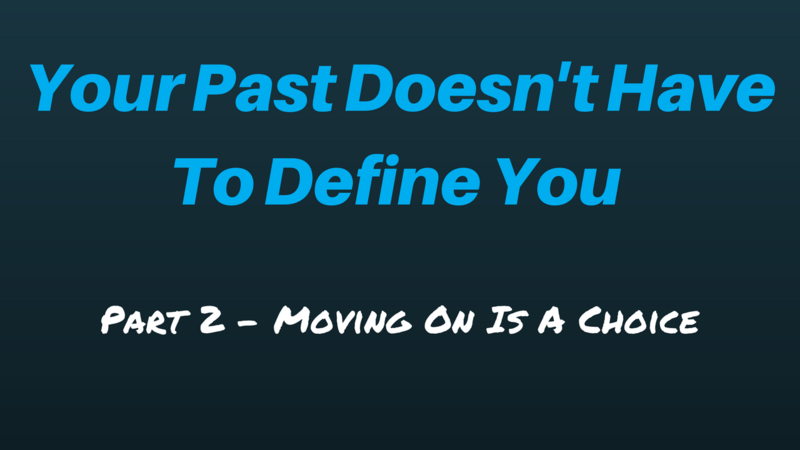 Learning to live out of our potential vs. out of the past is an intentional and ongoing process. It's our choice to pursue it or not. When we don't then we're limiting ourselves and ensuring that we'll continue in the life we have. When we pursue it great things can and will happen. I didn't know what awaited me as I took the next step, but I was excited to find out. Stay tuned for that part of the story.